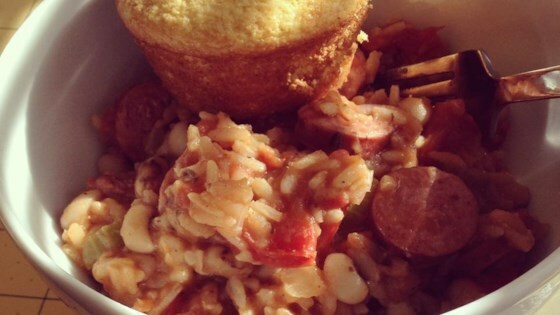 "I couldn't find a Hoppin' John recipe I really cared for, so I threw this together to enjoy black-eyed peas for New Year's." Cook and stir sausage in a large skillet over medium heat until meat is still slightly pink, about 8 minutes. Mix celery and onion into sausage; cook and stir until onion is translucent, about 5 more minutes. Stir garlic and red bell pepper into sausage mixture and cook until bell pepper is slightly soft, about 5 minutes. Stir brown and wild rice mix, black-eyed peas, tomatoes with their juice, chicken stock, and Cajun seasoning into sausage and vegetables. Bring to a boil, reduce heat to low, and cover; simmer 45 minutes. Remove cover, raise heat to medium-low, and simmer until stew is thickened, about 15 minutes. Season with salt and cracked black pepper. This has become a family favorite. We usually crock-pot it. I added some left over ham last time and that added a nice flavor. I've shared it with a number of folks, who all are making it now! Made this exactly as written and my whole crew loved it. (husband, myself, 11 yo, 6 yo, and 4 yo) I have tried different hoppin John recipes for years and this is now my forever Jan. 1 recipe!